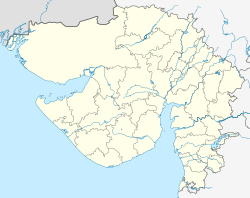 Borsad is a city and a municipality in Anand district in the state of Gujarat, India. It is located around 17 km from Anand. It is surrounded by the fertile Charotar region which largely produces tobacco, bananas, cotton, barley and other agricultural crops. Borsad was the seat of the Borsad satyagraha in 1922-23. Borsad is located at 22°25′N 72°54′E﻿ / ﻿22.42°N 72.9°E﻿ / 22.42; 72.9. It has an average elevation of 30 metres (98 feet). As of 2011[update] India census, Borsad had a population of 63,377. Males constitute 52% of the population and females 48%. Borsad has an average literacy rate of 68%, higher than the national average of 59.5%; with male literacy of 75% and female literacy of 60%. 13% of the population is under 6 years of age. ^ "Sardar Patel : Chronology of events". www.sardarpatelaward.com. Retrieved 15 April 2015. ^ Ambedkar, Dr. Bhimrao (1991). Waiting for a Visa (PDF). Mumbai: Dept. of education, Government of Maharashtra. pp. 4071–4090. Retrieved 15 April 2015. ^ a b James Burgess (1885). Lists of the Antiquarian Remains in the Bombay Presidency: With an Appendix of Inscriptions from Gujarat. Government Central Press. pp. 133, 266. Wikimedia Commons has media related to Borsad.